Would you recommend HuntCharts to a friend? I'm interested in how this could evolve into an 'integration finder' for ecosystems. E.g. 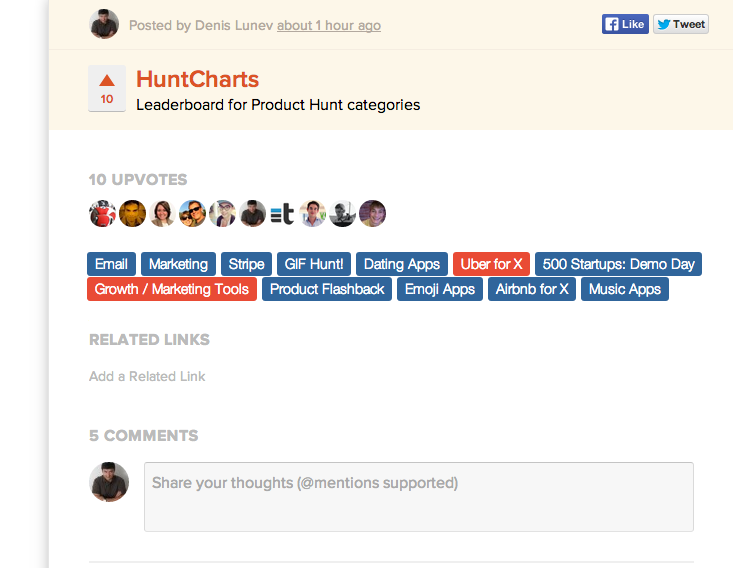 what would help me get best out of my Stripe account: http://huntcharts.com/#stripe @denlunev what do you think? @lukekndy Yeah, it's a good idea. I'm going to create a category for MailChimp soon, what other product's ecosystem you'd like to see? @lukekndy Put this list to my todo. @AnujAdhiya Ok, in the list as well. Looks like this kind of thing could be an integrated PH feature. It's nice. Love the idea of building your own collection. How about sponsored collections? I could see someone like Rackspace sponsoring http://huntcharts.com/#growth-ma... ..... or maybe sponsored contests for product makers? Denis this is really neat. How do ya'll think we should think about tagging at PH - allow community to tag? get mechanical turks to tag? @eriktorenberg How does tagging work now? Does tagging exist? Very cool. There should be a permanent link to this from PH imo.